• When potting flowers a coffee filter placed at the bottom of the flower pot will prevent the fresh dirt from falling out, while allowing water overflow to still seep through the seepage holes. • Use a coffee filter as a splatter guard in the microwave. • Place a coffee filter in between pieces of good china to prevent scratches. • Run out of paper towels? A coffee filter is a great grease absorber for cooked bacon. • Get rid of the corn silk easily from that corn on the cob with a dampened coffee filter run down the length of the corn. Every household has them. Finding creative ways to use those empty toilet paper rolls takes some imagination. • Save up your used toilet paper roll cardboard and donate them to your local library or school for craft purposes. • Cord keeper – store unused extension cords inside the old toilet paper rolls to keep them neatly folded. • Toilet paper rolls can be cut down the middle and used to keep rolls of gift paper neatly rolled up. • Rolls that are cut down the middle and or into two pieces can be used by your small animals. Pet mice and hamsters love to curl up inside them and Guinea pigs love to carry them around in their cages and gnaw on them. • To hold a fire starter for a camp fire. • Plastic bottles can be cut and used to store your keys and or cell phone while at the beach. • Removing the top and the front part of one about ¼ from the top makes a gadget and wire holder. You will have to cut one hole in the back of it so you can plug in your gadget. Once that is done, the next time you have to plug in your cellphone or iPod, simply use the premade holder. Plug it into the wall outlet, drop the gadget and its wires into the specially made holder until it recharges. No more messy wires running all over the place. This is the original post with instructions. • Make your own shampoo, and use the old (clean) lotion bottle as a dispenser. • Make your own foaming hand soap, and use the (old) clean lotion bottle as a dispenser. • Make your own homemade body wash, and use the old (clean) plastic lotion bottle as a dispenser. Try this formula: Mix together a 1/4 cup full fat coconut milk with 1/3 cup liquid Castile soap. Add a few drops of essential oil for a wonderful scent! Note: remember to clearly label when you reuse a bottle for something other than its original purpose. • Dryer sheets work great at keeping your drawers fresh smelling. Simply rip off a dryer sheet and place in the drawer. A dryer sheer works the same way for smelly shoes and sneakers. Just insert a dryer sheet inside each shoe to freshen them up in between wear! • Dryer sheets can also be used to remove static from the body. Simply take one and rub it over a person’s hair to remove the static. • Cleaning mirrors and glass is a breeze when you use used dryer sheets. 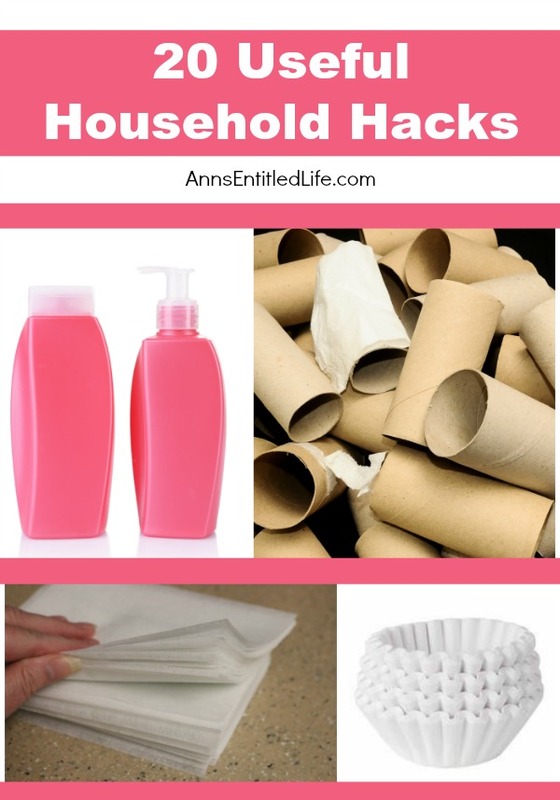 • You can also dust with a dryer sheet as well as remove pet hair from furniture. • Wipe a dryer sheet over hair or clothing to quickly eliminate frustrating static. 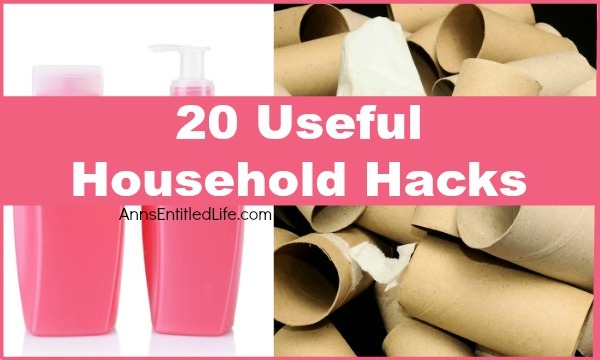 What other household hacks do you have for these products? To keep the soil from coming out of the bottom of a potted plant I use a piece of napkin or newspaper…it’s an added bonus for the plant when it decomposes. As for the used dryer sheets, i have used them in sewing projects in place of facing (used for colors and lapels in some garments). Unused dryer sheets can be placed in a hat to repel insects (my husband is a tasty morsel). Oops, typo! I meant to say “collars” and not “colors”. I save all my dryer sheets after using in a zip lock bag in the bathroom as they are amazing at cleaning the shower and tub…soap scum doesn’t stand a chance! Another use I give to the used dryer sheets is to secure 2 or 3 of them to my floor sweeper. My floors , wood and tiles, are shiny and clean in a fast way. Good luck. I put dryer lint in my empty toilet paper tubes to make handy fire starters. If you wipe your clean mini blinds with dryer sheets it helps keep the dust and dirt off of them. I have been using new, wet dryer sheets to get the dried on bugs off the front of my car for about three years. Just wet the NEW dryer sheet, rub over all buggy areas on your car and let it set for a few minutes. The fabric softener in the dryer sheet loosens the bugs immediately. Then rinse and rub the loose bugs with a clean, wet rag. DONE. Love the ideas! I would caution those with pets…the dryer sheets if ingested can cause terrible reactions. My cat chewed on one 7 years ago, and has suffered ever since with hyperesthesia. What is hyperesthesia? My chihuahua lives dryer sheets, now I’m worried! Feline hyperesthesia is a seizure disorder which has resulted in my cat mutilating his tail. I was just warning some pet owners about the possibility of harm from dryer sheets. These are full of chemicals and not all animals react the same when eating the dryer sheets. How do you mean? Do you just rub at the stain? Clean dryer sheet? Used one? Yep just rub the stain with an unused sheet! I haven’t tried using a dirty one but it might work! I cut used dryer sheets in 4 and wrap 1 around my cotton pads to remove nail polish. It works like a scrubby and really helps the non-acetone polish remover work quicker. Dr Oz say Don’t Use Acetone! My mom uses used dryer sheets in place of regular Swifter pads. It takes two of them, fold each one around each side of the Swifter broom (they will overlap on the bottom) and tuck each end into the slots on the top. They work even better than the regular pads that you buy for the Swifter when it comes to picking up hair off the floor and trap dirt and dust just like a Swifter pad. I love using something I would normally throw away in the place of something I would buy. To clean the sole plate of your iron, run a hot iron over an unused dryer sheet. It will remove any burnt on debris without scratching the metal. The dryer sheet can then be used in the dryer, and then again for any of the other suggestions mentioned above. You can dust your base boards with dryer sheets, and cut your toilet paper roll in half, then cut little slits at the bottom of each half to make them fold in, fill with soil, and put in a seed. They become excellent seed starter pots, along with cardboard egg cartons, they can be planted easily as well, once the seed has started to grow. These are awesome! Keep ’em coming everyone.. 😁 I love this! Who knew dryer sheets were so useful?! I use toilet paper rolls to keep my gloves sorted. They’re just the right size to hold a pair and I save oodles of time fishing around for a matched pair. I might tackle my sock drawer next! And my mom’s nylons. She washed them and never paired them up…this is a great idea to sort them up. Coffee filers are used to make wreaths – seen them on pinterest all white and then colored on the edges. Be careful with fabric softener sheets…they are extremely toxic ~not only for humans but to the Earth also, they are made with carcinogens and should be banned! They can be used to keep rodents & mosquitos away-rule of thumb if it wards off pests it shouldn’t probably be used on human bodies! Except, many herbs and spices can ward off insects. For example, anything spicy can keep ants away (I use pepper and cinnamon) and lavender helps keep spiders away. I was hoping someone would bring this to light. All these chemicals are causing cancer and autoimmune diseases and probably lots more! Not just dryer sheets. Nail polish messes with hormones that can lead to cancer. How about all those room fresheners people spray around a room and those that are automatic. I’ve been in someone’s house and the thing sprayed and I started couphing! Just about everything is bad! I don’t wash clothes all day everyday. That’s the least of my worries. Thank you! I’m all for banning these nasty products. Save your lunch size applesauce containers for potpourri burners for easy wax clean up. They don’t melt so don’t worry. Used dryer sheets and alcohol clean dry erase boards easily with no scrubbing involved. Can reuse plastic container i.e.,wipes,or coffee creamer to store wipes in and just add a little alcohol to make wet. You can use dryer sheets when you wash your car too! Wet a dryer sheet and use on the front/grille of the car to remove all the bugs and guts and then wash as usual! Saves time not having to scrub all day! In the UK, we are not allowed to use toilet roll tubes. We certainly cannot allow children to bring them in. When you think where they have been and the state of some houses, you really wouldn’t want to use them. I do use them at home and collect them for my grandson. But then my loo is clean!!!!!! You could microwave toilet rolls as it kills all the germs. Why not? The microwave skills everything. When the commode is flushed bacteria can travel as far as 6 feet away. coffee filters are wonderful for cleaning mirrors and windows because they are lint free. How come almost everyone uses dryer sheets. They are full with chemicals. And the smell. Why does everything have to smell?The other day I tried to buy detergent without a smell and had a very hard time finding one. All those chemicals in our environment is not good. What is wrong with everything smelling natural. I never use chemicals.Instead I use natural products.Peroxide is amazing for cleaning cat litter tray.Smell is gone instantly.I also clean my toilet and countertops with it as it is non toxic. I add baking soda to my laundry detergent to clean better,brighten and remove odours. I use flannels spritzed with essential oils as dryer sheets.and scent house with cloves and cinnamon sticks on stove then later strains for effective mouthwash. All Free and Clear. My children and I have very sensitive skin and this worked great even when they were infants!.Scent free.